Man o man, this looks like a great way to start out April. 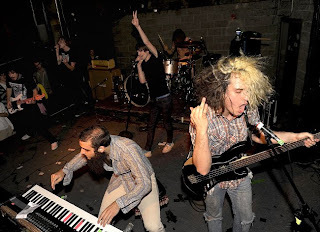 Foxy Shazam is an eccentric experimental outfit from Cinnciniti that dropped their newest album in February. With them will be The Young Veins and Bad Rabbits. If you're a fan of Prince and the motherfu*kin Time or any form of soul then don't miss out on Bad Rabbits. Finally I get to The Young Veins a band that sounds like they're heavily influenced by the psychedelic music scene, always great in my book. I haven't been this hyped up for a show in a while, this should be one of the greats of the year.